Thecla Schiphorst lives and works in Vancouver, British Columbia, Canada. She is a computer media artist, computer systems designer, choreographer, and dancer. She has an interdisciplinary M.A. in computer compositional systems, and undergraduate degrees in contemporary dance and computer systems from the Simon Fraser University. Currently, she is an Associate Professor in Interactive Arts at the Simon Fraser University. She has published numerous essays and articles, and her lectures focus primarily on body and technology in the visual and performing arts. She has served on numerous juries, including Siggraph, Images du Futur and the Canada Council for the Arts. She has been a Board Member of ISEA '98, and the co-chair of the Second Annual Conference on Dance and Technology. She is co-founder, co-director and co-curator of digital earth. For her contribution to the development of New Media Technologies Production and Research in the context of Artistic Practice, she received the 1998 Canada Council Petro-Canada Award in New Media. As a member of Life Forms original design team, Thecla Schiphorst collaborated on the design and development of the interface. Life Forms is a computer compositional software for animation and choreography. Since 1989 she has been collaborating with choreographer Merce Cunningham, supporting his composition and exploration of new dance using Life Forms. Thecla Schiphorst is also the Artistic Director of immerce , an interactive multi-media Archival Project ranging from the creative process of Merce Cunningham and John Cage to mechanisms for interactive selection. In 1995, the piece won three International Digital Media Awards including First Place in the Interactive Installation Category, People's Choice Award, and Special Achievement Award. 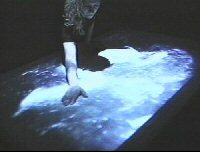 It also won an award of excellence in multi-media at the Graphex competition in Vancouver in April 1995. immerce was exhibited at the Interactive Media Festival in LA in June 1995. Thecla Schiphorst's work focuses on notions of the body, the relationship between the statistical and non-statistical representations of the body. Her work questions the way technology mediates the representation and experience of the body, and by extension, the representation and experience of space and time. Using her formal education in computing science and contemporary dance as a base, her work attempts to integrate models of scientific representation with the experience of the physical body. It also aims to subvert the 'visual/objective' relationship often attributed to the act of seeing. Her work confronts views of interactivity and questions basic technological mapping. It invites relationship interaction through an experience grounded in proprioceptive knowledge. Thecla Schiphorst's work has been exhibited extensively. Her interactive computer video installations have been shown in galleries and festivals around the world. Notably, Bodymaps: artifacts of touch , a work (A) (B) that uses touch and proximity sensors to construct an interactive synaesthetic interface, has been shown in many group and solo exhibitions: at the Western Front in Vancouver B.C. ; at Ars Electronica '96 in Linz, Austria; at intecation '97 in Ogaki City, Japan; in Paris at the Canadian Cultural Centre in June '97; at Siggraph '97 in Los Angeles, California, among many other venues. Her interactive work Felt Histories: re the fact of the doorframe premiered at Artpeak Gallery in Vancouver in 1998 and exhibited at the Kenderdine Gallery in Saskatoon, and at the Oakville Gallery in Oakville Ontario, in 2000. Through the act of touch and seeing, Felt Histories: re the fact of the doorframe sensitizes viewers to the privileged relationship among the senses. Thecla Schiphorst is now working, in collaboration with Susan Kozel, on the research and development phase of her new project, whisper. A participatory installation, whisper addresses issues of preconceived physical responses to an awareness of new senses.